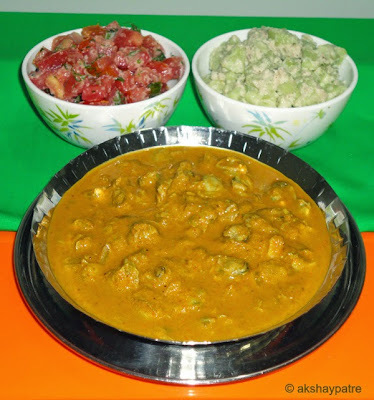 Kubbe ambat or clams gravy recipe - I am a great fan of clams. Be it ekchimpi ambat, upkari, sukke, vade or kubbe ambat. Kubbe ambat is made in few ways. The clams are broken with eelige and one sided shell is used along with flesh to make ekchimpi ambat. That makes a very delicious curry for steamed hot rice. But breaking small clams with eelige or aadli is very difficult. If the clams are larger in size then it is very easy to break. I got small variety of clams. So, I made this kubbe ambat by using easy method. Boiled the clams, separated the flesh and then used it in the curry. A very easy and simple method. The curry was very delicious and we liked it a lot. I served this curry with hot rice, tomato salad and cucumber raita. Take a large plate and combine together the coconut, onions, fried fenugreek seeds, roasted coriander seeds, garlic cloves, tamarind, chilli powder and turmeric powder. Put the ingredients in a mixer jar and grind it to a smooth paste in 2 batches using 3 cups of water. Transfer the ground paste to a large bowl and set aside. Place the vessel on low flame and boil the clams till they open up completely. When done, remove the vessel from the flame and allow the clams to cool. Then separate the flesh and set aside. Heat 2 tsp of oil in a pan and add the chopped onions. Saute for 2 - 3 minutes. Add the clams flesh and 1 cup of water. Add ground masala paste and salt. Mix well and bring the curry to boil. Simmer for 7 - 8 minutes and remove the vessel from the flame. Keep it aside for 5 minutes. After 5 minutes, serve kubbe ambat hot with rice, dosa, chapathi or rice roti. 1. Take a large plate and combine together the coconut, onions, fried fenugreek seeds, roasted coriander seeds, garlic cloves, tamarind, chilli powder and turmeric powder. 2. Put the ingredients in a mixer jar and grind it to a smooth paste in 2 batches using 3 cups of water. Transfer the ground paste to a large bowl and set aside. 4. Place the vessel on low flame and boil the clams till they open up completely. When done, remove the vessel from the flame and allow the clams to cool. 5. Then separate the flesh and set aside. 6. Heat 2 tsp of oil in a pan and add the chopped onions. Saute for 2 - 3 minutes. Add the clams flesh and 1 cup of water. Add ground masala paste and salt. Mix well and bring the curry to boil. Simmer for 7 - 8 minutes and remove the vessel from the flame. Keep it aside for 5 minutes. 7. 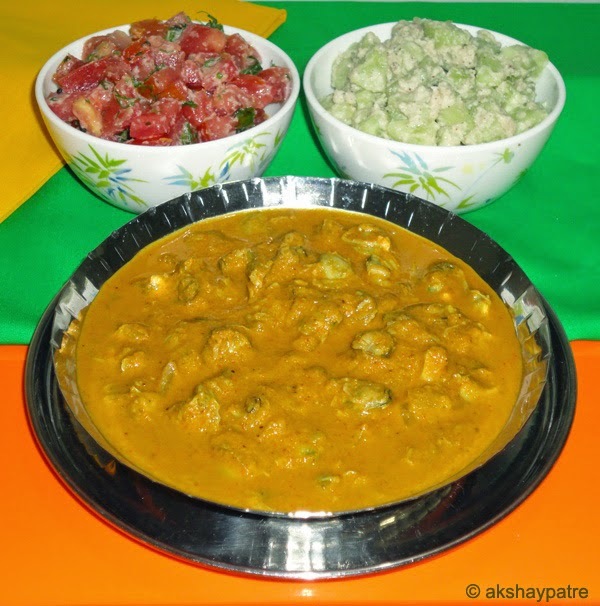 After 5 minutes, serve kubbe ambat hot with rice, dosa, chapathi or rice roti.